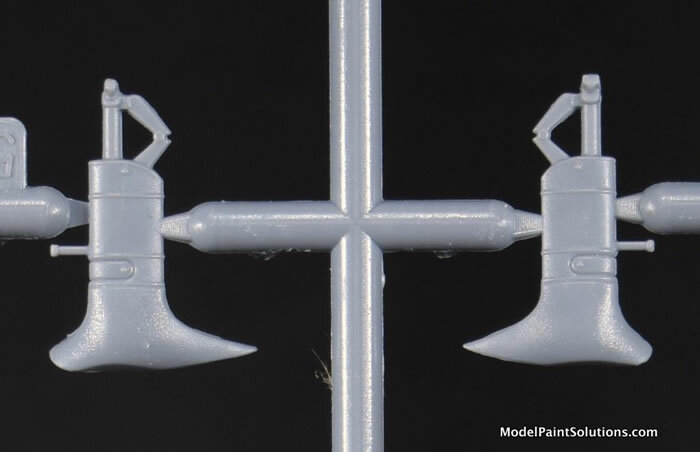 63 parts in grey styrene, 7 clear parts, one PE fret with 5 parts, and one decal sheet with markings for 3 airframes. 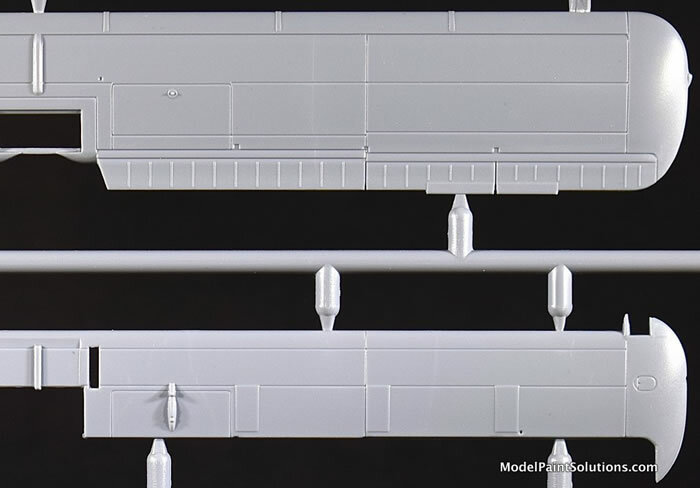 The kit features straightforward, conventional engineering with nicely inscribed details and panel lines that are crisp and scale-appropriate. A well detailed cockpit is provided along with crystal clear canopy parts and beautiful decals from Cartograf. 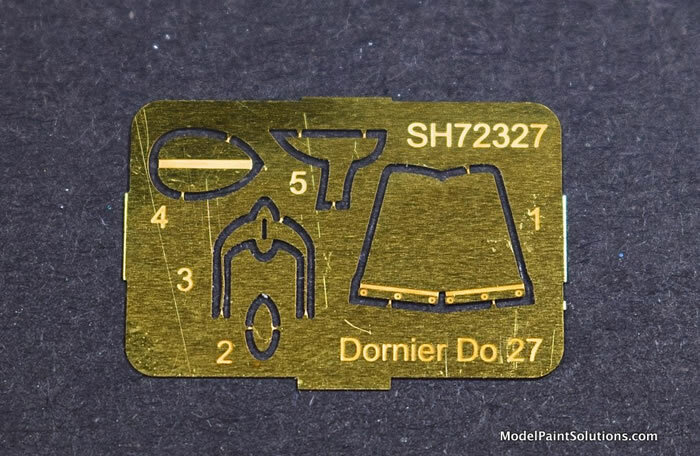 Being a limited-run kit, there are no alignment pins. This is another beautiful kit from Special Hobby of a lesser-known aircraft that’s long deserved a quality injection kit. 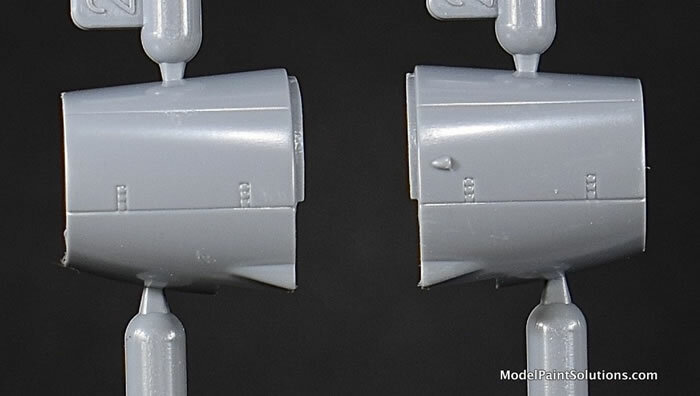 The inscribing is crisp, the assembly sequence is straightforward, and the result will be a well-detailed, little-seen model. The Dornier Do 27 was a German single-engine STOL utility aircraft manufactured in the mid 1950’s by Dornier GmbH (later DASA Dornier, Fairchild-Dornier) in Germany and CASA in Spain. Its configuration was that of a classic high-wing, "tail-dragger" aircraft with fixed landing gear. The Dornier facilities in Spain designed the Do 25 to a Spanish military requirement for a light utility aircraft. It was powered by a single 110 kW (150 hp) ENMA Tigre G.V. engine. The Do 25 was not selected for production but became the precursor to the production Do 27. The Do 27 prototype first flew in Spain on June 27th, 1955. Most production aircraft were built in Germany with the first German-built aircraft taking flight on October 17th, 1956. Fifty more were manufactured in Spain by Construcciones Aeronáuticas SA (CASA) as the CASA-127. 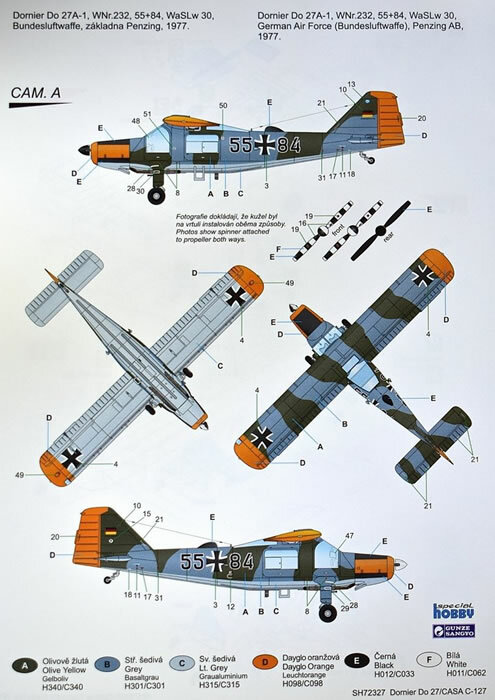 The German Air Force and Army ordered a total of 428 Do 27A and Do 27B (with dual controls) airframes. A later version with the same basic specifications, but equipped with wider-track landing gear was known as the Do 27Q-5. This aircraft fitted with a larger engine (254 kW/340 hp Lycoming GSO-480-B1B6) and a three-blade propeller was offered in twin-float seaplane versions called the Do 27S-1 and Do 27H-2. 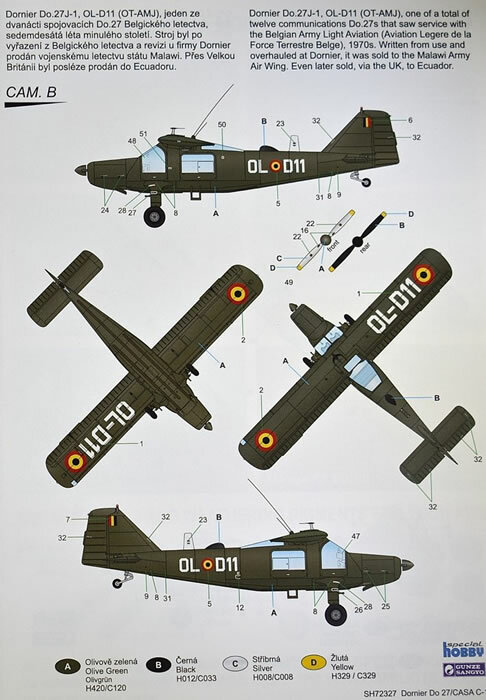 In addition to the military operators in Germany and Spain, Portugal received 40 new-build and 106 ex-German-built Do 27’s. The Portuguese Air Force used them extensively during the Colonial war in Portuguese Africa in the 1960s–70s. In April 1973 two Do 27s were shot down by SAM-7 Grail shoulder-launched AAM’s in Portuguese Guinea. The Do 27 was notable for being the first mass-produced aircraft in Germany after World War II. It was appreciated for its wide, comfortable cabin and excellent short-field performance. 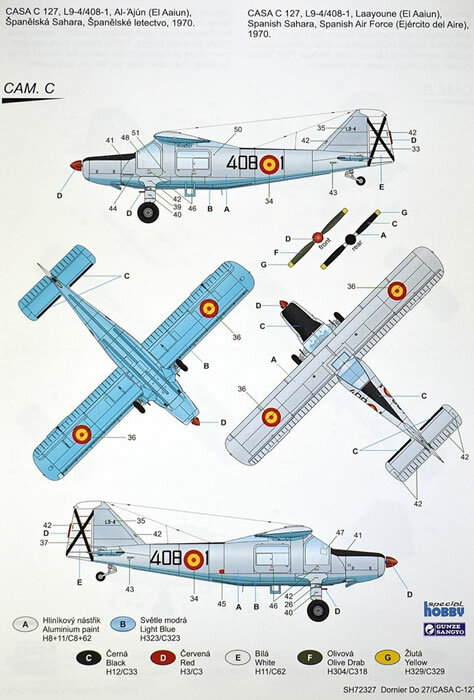 Special Hobby has a long history of producing nicely detailed models of rare and esoteric aircraft. This was fortunate for me as I quickly became bored early on in my modeling career with the abundance of Messer-Wolfs and Spit-Stangs on the hobby shop shelves and model show display tables. I preferred, instead, to build kits like the MPM/Special Hobby Fairchild PT-19, Grumman XF5F-1 Skyrocket, or Fokker D.XXI. 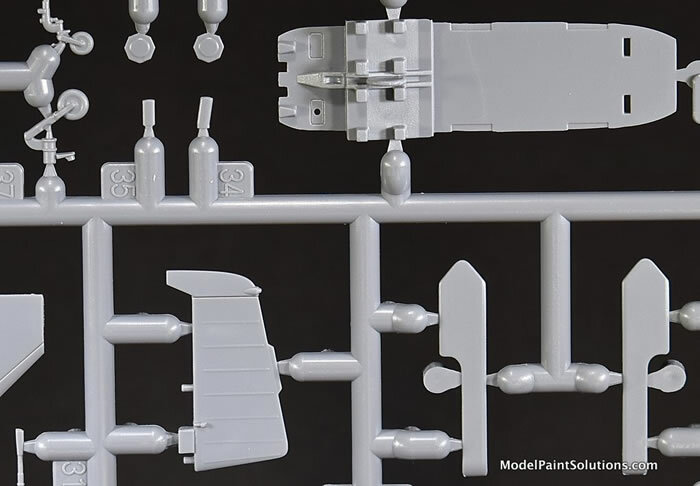 Many modelers with a taste for esoteric aircraft have long benefitted from Special Hobby’s penchant for filling this void and I’m one of them. 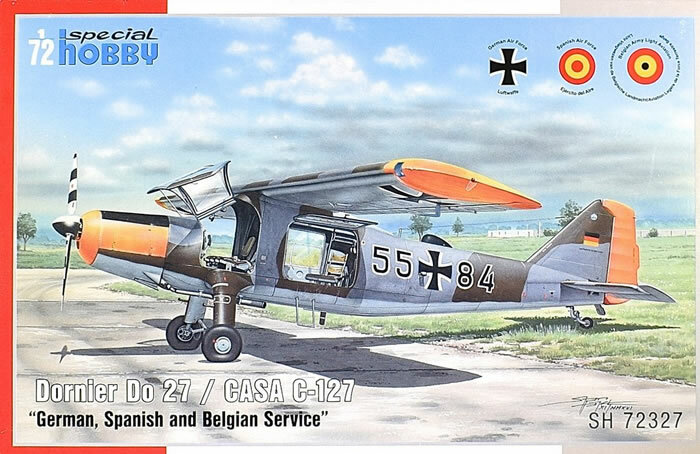 True to form, Special Hobby has just released a very nice model of the lesser-known Dornier Do 27: a very nice looking, strut-less, high-wing monoplane that has long been on my build list. 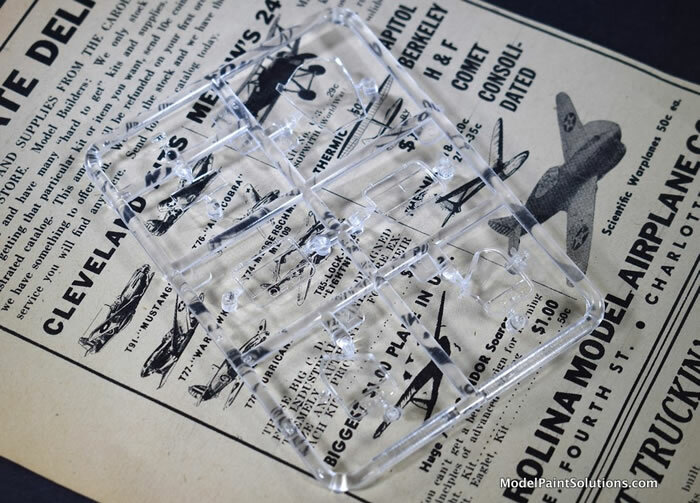 Although Special Hobby kits are considered limited-run their recent offerings have a level of detail and a fidelity of inscribing that rivals mainstream manufacturers. Keep ‘em coming Special Hobby! 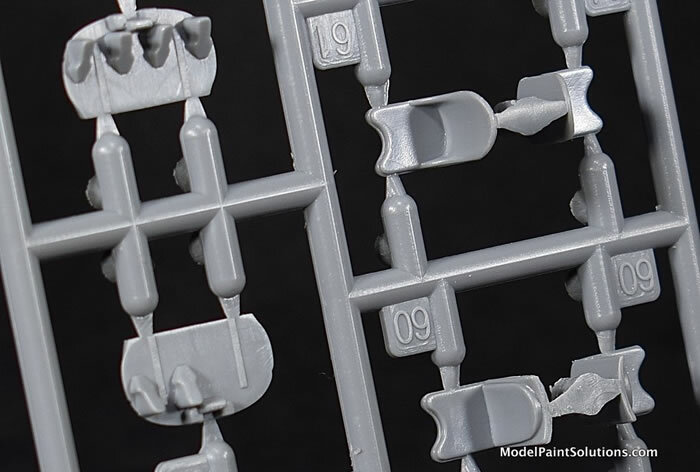 In the typical end-opening box there are four sprues of light grey plastic in a re-sealable bag along with an individually bagged decal sheet and one sprue of clear parts. Upon inspection the crispness of the recessed details is immediately apparent. 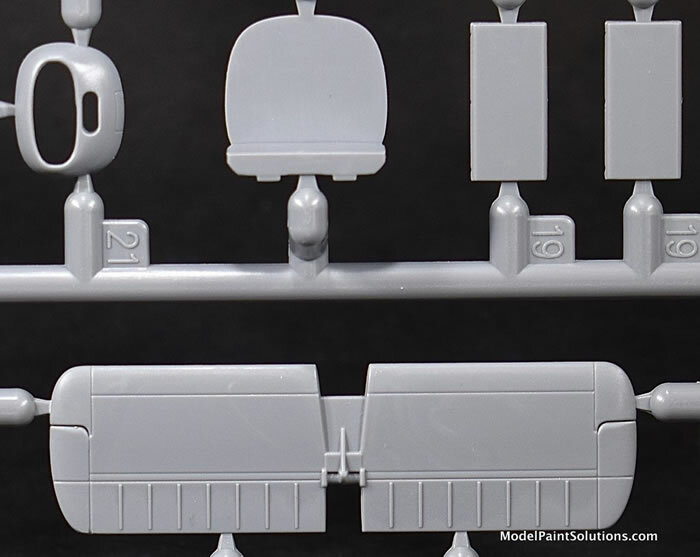 The panel lines are cleanly defined and scale-appropriate. 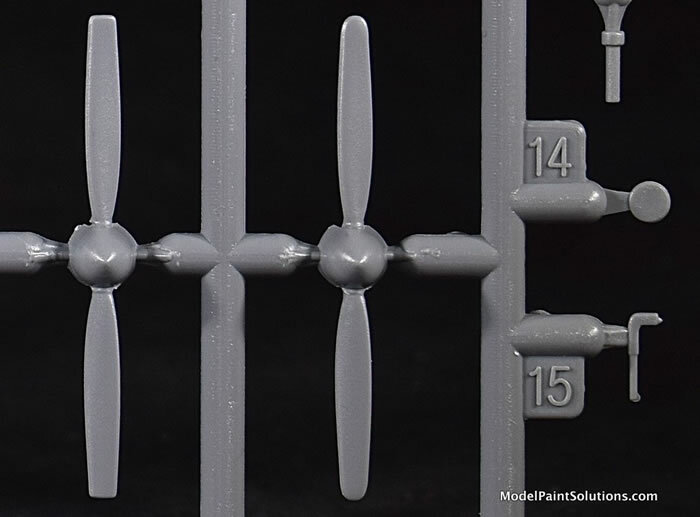 Raised details or details rendered in relief such as the corrugations on all the control surfaces (rudder, elevators, ailerons, and flaps) are beautifully done. 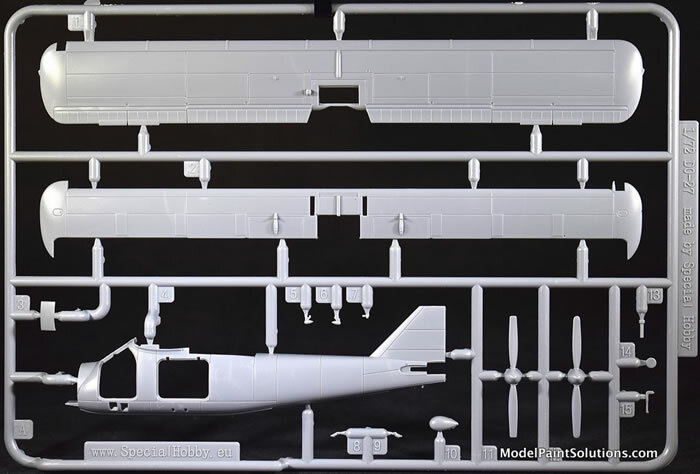 Prior to starting assembly one should decide which scheme will be modeled as there are parts that are scheme-specific, especially in the fuselage interior where you’re offered two versions. 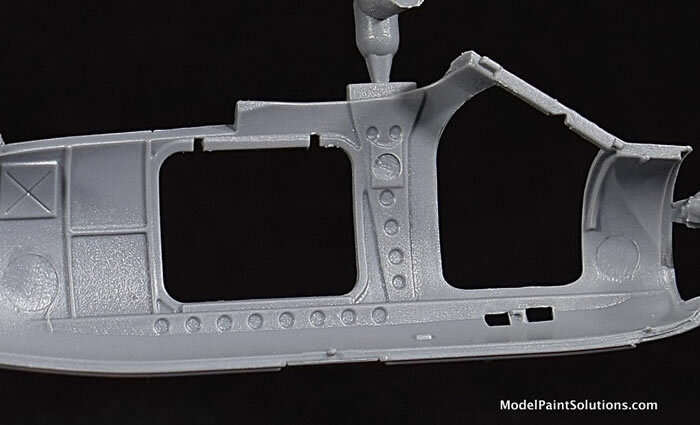 Whichever version you choose, all the cockpit and fuselage cabin parts are cleanly molded with crisp details. 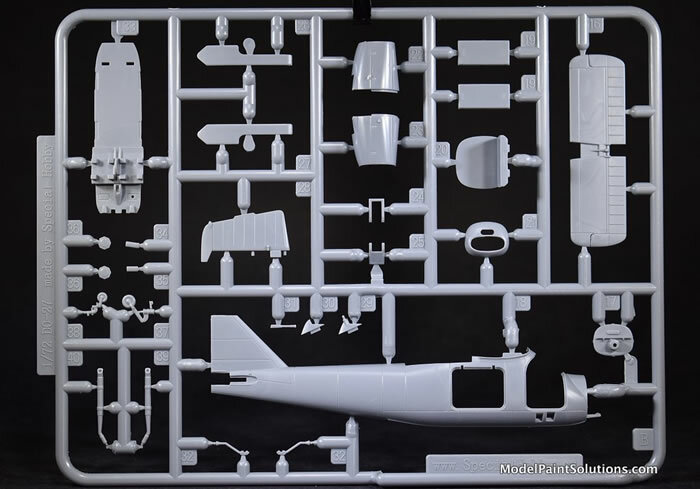 Moreover, there is an abundance of detail here including instrument panels, seats (front and back), and fuselage side panels. 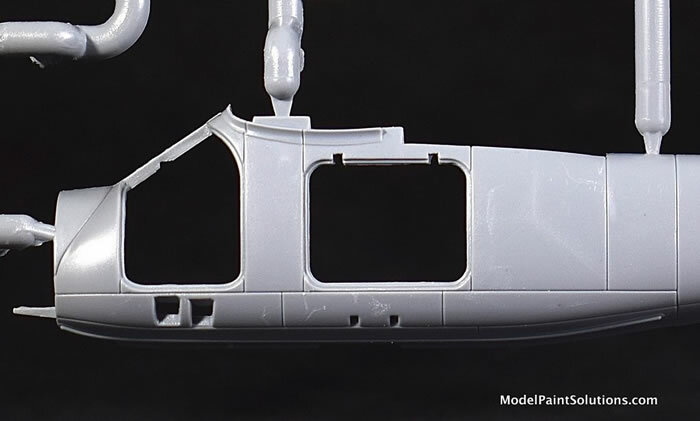 Once the fuselage is zipped up, the rest of the build is easy and straightforward starting with the two-piece upper wing that has the leading edge slats cleverly molded so as to show the prominent underwing slot. 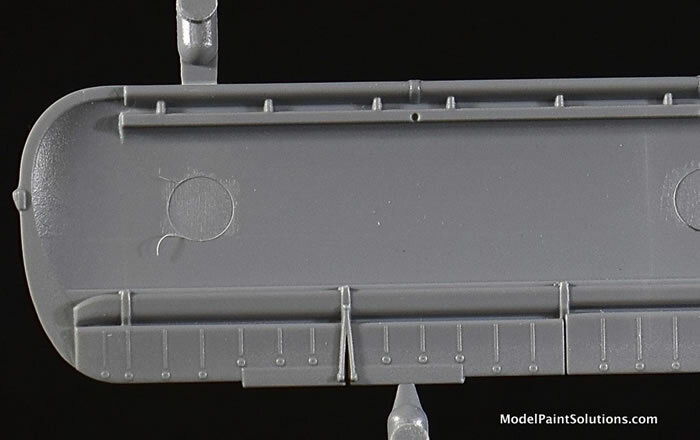 Both the ruder and horizontal stabilizer/elevator parts are single pieces and have the same crisp detail found on the fuselage and wing. 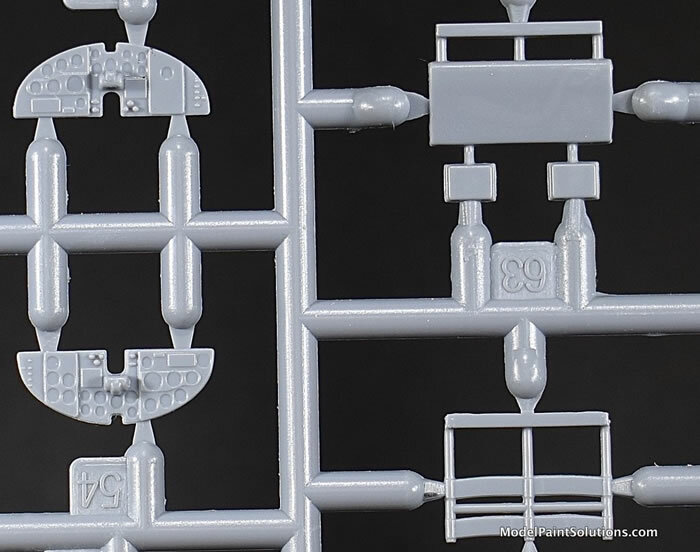 In addition, the single-piece design of both parts obviates a lot of pre-assembly work and seem filling: Thank you, Special Hobby. The canopy parts are nicely molded and crystal clear. A very nice feature is that the combination canopy-doors for the front two seats are poseable in the open position as are the aft cabin doors. With the addition of the fixed main gear, propeller, and tail wheel, the assembly is complete. This is a straightforward, conventional kit that should go together quickly with little fuss. 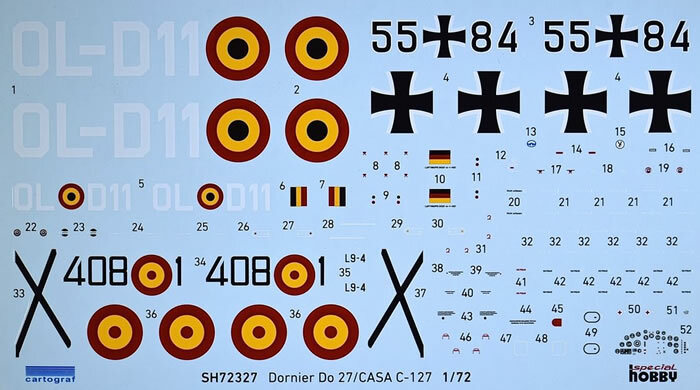 The decal sheet, printed by Cartograph, has excellent registration and color density with very little carrier film surrounding the individual decals. German Air Force (Bundesluftwaffe), Penzing AB, 1977. Spanish Air Force (Ejercito del Aire), Spanish Sahara, 1970. 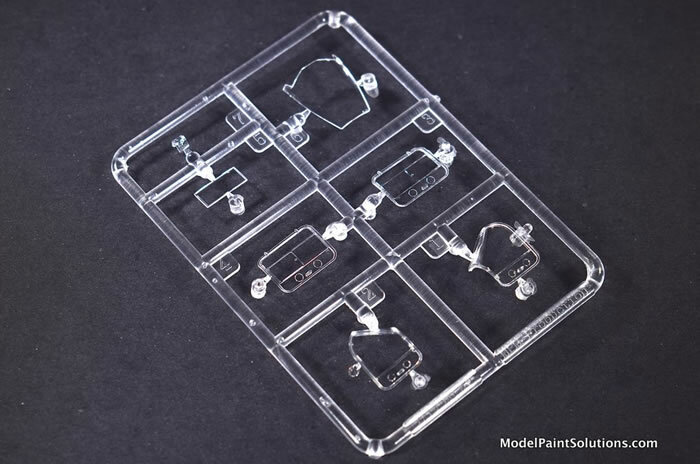 This is a beautiful kit that will easily build into a very detailed model. The inscribed details are crisp and scale–appropriate, the clear parts are crystal clear, and the quality decals are from Cartograph: ‘nuff said. Don’t let the limited-run nature of the kit put you off. The details here are as good as you’ll find and many kits from mainstream manufacturers and nothing beyond anyone with a little patience. Highly Recommended!